Description: The flowers are in long, slender, fuzzy, silvery green, terminal flower spikes. The individual flowers are tiny and have 4 ovate, whitish to partly translucent lobes and 4 stamens. 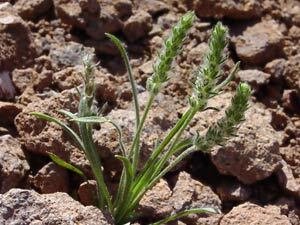 The leaves are green, basal, narrowly linear to linear-lanceolate in shape, and densely to lightly covered in shaggy hair. The plants are completely covered in white, woolly hairs. 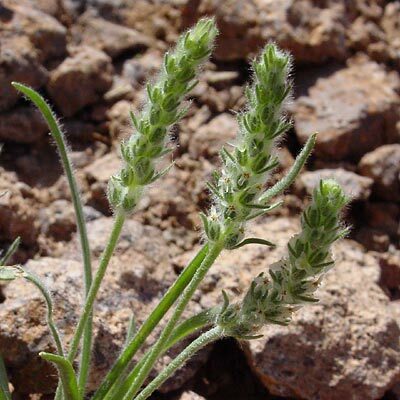 The similar Desert Indianwheat (Plantago ovata) has shorter, fatter, tanner, terminal flower spikes with larger flowers.